One of my favorite things about the holidays is the arrival of colorful envelopes in the mail, seasonal card enclosed. 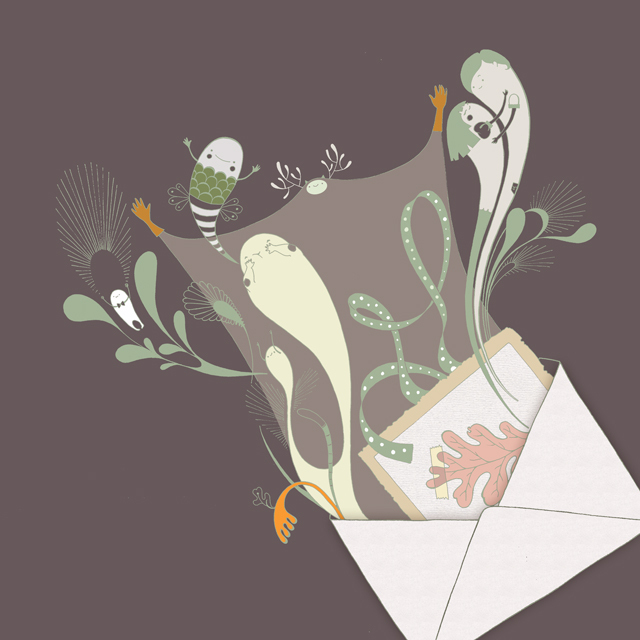 They come from older relatives, and a few friends who are intent on preserving the arcane art of postal correspondence. With the internet, and our capacity for light-speed exchanges across the globe, postal communication has been rendered all but obsolete. Nonetheless, I'm yet to encounter an e-card or Facebook wish that elicits the delight of a tangible card, of a handwritten letter with its unique folds and inky dents. There's something very enjoyable about the well-loved edges of a postcard that has been processed by the mail system, or the satisfaction of feeding a weighty envelope to the mailbox...! As much as I love snail mail, I confess to often letting a sense of inconvenience overpower my good intentions. The small effort and planning it all takes means that, some years, I send out a deluge of holiday cards —on others, not even one. But now I've discovered a way of correcting this: since I have a hard time meeting the holiday deadlines, I will no longer wait for the holidays to be my cue! - Carry one at all times. - Fill it out on a whim. - Drop it on the first mailbox that crosses my way. I'll report back with the results of my experiment. What about you? Do you have a clever routine that has made it fun and easier for you to mail letters, cards, and care packages? LOVE this post, Ana! Of course, this topic resonates deeply with me. Not only do I enjoy handcrafting my own cards, I also enjoy gathering a stash of cards & postcards (including your designs!) to send via snail mail for birthdays & other special events, thank you's, encouragement & just because. Admittedly, I wish to send more than I actually do nowadays, so I like your idea of carrying one at all times. Today I'll tuck a couple in the glove box along with a pen & stamps for those moments when I could jot a quick note in the car (while waiting for my daughter's school bus, for instance.) Love your illustration, too! Glad it speaks to you, Lisa! I think the cardmaker's job to be a beautiful and important one: providing empty little vessels, so that others can fill them with their own thoughts and wishes. That thought is one of the things that inspire me to make cards! I love to get mail that is unexpected. My husband travels all the time and sends me a post card every now and then. I carry them around with me in my planner and when I start to miss him I pull them out. Thanks for the reminder of how nice it is to receive this kind of mail. I am going to start sending out cards randomly, too. I am looking forward to hearing about how your plan goes. I received one in the mail a few weeks ago, very unexpectedly. I caught myself reaching for it during the day, smiling every time I remembered it... Cards can have that effect: a quick glimpse and your whole day becomes a little brighter! ...And since people tend to hold on to them instead of trashing them, cards that can be framed as tiny works of art (or have some other extended use) are ideal, in my opinion. I love this post! It is SO wonderful to send and receive "snail mail" especially on pretty paper!